I’ve never felt a movie’s intentions and my reaction diverge in quite the way they did sitting in the theater crying to Enough Said. That’s in no way the fault of the filmmaker, who wrote and directed a sweet, wry romantic comedy about love post-youth, post-divorce. Of course James Gandolfini was still alive during shooting. It stings. It stings on a level that the mild satire of Los-Angeles-upper-middle-class values can’t even approach. It’s an enormously difficult film, in spite of and because of its lighthearted core. It makes me wonder why James Gandolfini meant so much to me and I hadn’t even realized, why I found myself tearing up every time he appeared on screen. Of course that’s a testament to Gandolfini as an actor—the only way I knew him. As Albert, who runs a television history library, he knows the Channel 4 Sunday morning lineup like the back of his hand, but has no idea what’s on now. For safety’s sake The Sopranos probably doesn’t exist here, and without it, worthwhile modern TV might not either. 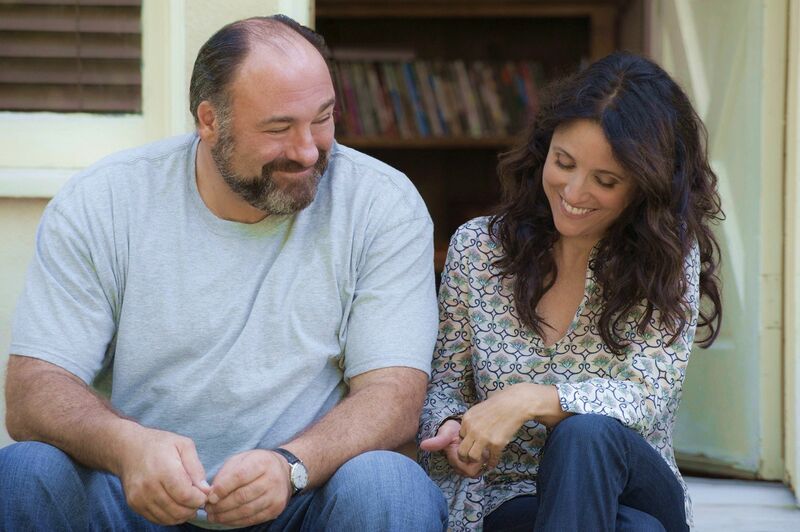 It is likely that a large segment of Enough Said‘s audience, not to discount fans of writer/director Nicole Holofcenter—who made Friends With Money and the wonderful Please Give (which takes on death with more intention than this film)—are coming to give Gandolfini a suitable farewell. This is a good opportunity to do so. It’s almost a classic comedy of remarriage, but in a different mold than, say, The Awful Truth: neither lead has any interest their ex. The neat plot brings us Eva (Julia Louis-Dreyfus), a masseuse, who winds up dating Albert and massaging his ex-wife (Catherine Keener). So it’s a comedy of remarriage in that past couplings come to influence both parties more, and more negatively, than they ever would have hoped. And that’s where the comedy comes from. The plot is smart, but not too smart to keep its charming leads from having to do most of the work. Like The Philadelphia Story or The Lady Eve, you can see they’re meant for each other—but they just keep talking their way out of it. Some people would be better off if they could just shut up. But there’s something startlingly youthful, even naïve, about Eva and Albert’s romance. Sitting on his steps, he asks, “wanna kiss?” and they could easily be subbed out for their college-bound kids. Neither is prepared to deal with inevitabilities: Albert is naïve in his trust, his readiness to let himself be hurt, and Eva is naïve in her conniving—she’s been burned before and doesn’t want it to happen again. So his ex-wife becomes her personal TripAdvisor, to borrow a comparison from one of Eva’s friends. The writing is sharper, the acting better, and the movie funnier than that description might suggest. Still the experience, at least for me, was trying. Any movie about aging—hell, any movie about anything engages in some way with death. But as Eva becomes more confused and embittered by Albert’s ex-wife’s complaints, her jibes about his weight and his self-care take on a much sharper edge, and I’m immediately pulled back to why I came to see this movie in the first place. When I first heard about James Gandolfini’s death, I expressed to a friend regret over the roles he wouldn’t get to play, the movies I wouldn’t get to see. He had a way of lighting up even a near unwatchable film (Killing Them Softly, 8mm). In featured roles in better movies (Zero Dark Thirty, In The Loop), and even in cameos (True Romance) he was equally indispensable. Not to mention as Tony Soprano over 72 near-perfect hours, completely fulfilling the promise of a character-actor-as-leading-man, full of big feeling without ever chewing scenery, a murderer who somehow never lost your compassion, who always wore his heart on his sleeve. It’s the same heart you see in Enough Said. But my friend was offended that I could be so callous as to mourn the actor when others lost a father, a husband, a friend. But if all I lost was an actor, why was I woefully choking up in a movie, a romantic comedy no less? And then it clicked. Because in his largesse and his largeness, his obstinance, his sense of humor, his “general slobbiness,” as Albert puts it, in his sometimes inadequate parenting, his rage and his warmth, James Gandolfini, in Enough Said and The Sopranos, is my father. And only knowing him onscreen doesn’t mean you didn’t know him as a human being. We all knew him as a human being. That’s what it means to be a great actor. If you came for a review, it’s pretty great. And I’ve said enough. Written by: Alexander Tsebelis on October 24, 2013. Last revised by: Double Exposure, our reviewer, on October 25, 2013.